Three students from the College of Saint Benedict, Katie Ebben, Marita Vievering and Megan Sinner, delighted members of the monastic community with stories of their visit to St. Walburga Abbey in Eichstaat, Germany, the founding monastery for the Sisters of the Order of Saint Benedict, St. Joseph, Minnesota. The beginning of St. Walburga's Abbey has a fascinating history. Three British Benedictines, Walburga and her two brothers were sent to Germany to establish new monastic foundations. Enduring the travel through dense forests, on wild rivers, and in danger from marauding tribes took great strength of purpose by these courageous Benedictines. In 752 Walburga's brothers founded a monastey in Heidenheim, Germany. This was a double monastery for men and women. Walburga eventually became the Abbess of both monasteries. She proved to be an outstanding leader, noted for her knowledge and wisdom. She was skilled in medicine, which she practiced in the monasteries, and among the people of the area. Walburga wrote about the lives of her two brothers, and became known as the first female Christian author of both Britain and Germany. Walburga died in 777 with a reputation for great holiness of life. Later, her remains were transferred to Eichstaat and put in the care of Benedictine sisters at the Abbey of St. Walburga. Monastic life has continued in that Abbey from 1035 until today. It was from this monastery that six sisters emigrated to St. Cloud, Minnesota, in 1857, moving to St. Joseph, Minnesota in 1863. 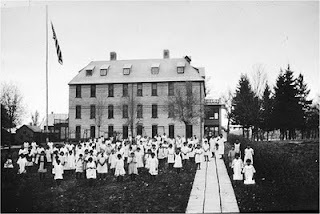 They came to teach children of European settlers and live a monastic life on the frontier. In time, they founded eleven other monasteries, four of which are in other countries. Now comes the Eichstaaat Connection for the three young women from the College of Saint Benedict. After their study abroad program, they decided to visit the Abbey of St. Walburga. Here they met Abbess Francesca, who endeared herself to the students with her warmth and sense of humor. Stories were told of the history of the Abbey, and the difficult period of secularization in the 1800s when the government took over the property of all monasteries. Katie, Marita and Megan were amazed at the courage and great strength of purpose of the Sisters in the face of all the hardships they endured. They proudly announced that the abbey in Eichstaat had sent their best Sisters to St. Joseph, where in time, they established an academy for young women, a forerunner of the College of St. Benedict. This is my first entry in our community’s blog. I have an interest in our community’s history and in the recent past have been completing research on various aspects of it. In doing so, I have become acquainted with many valiant women who went before us. It is some of their stories that I will share in my blog entries. With the H1N1 flu season getting our full attention I began wondering about the 1917-1919 flu epidemic. I know there is a row of graves in our cemetery of sisters—many very young—who died from the flu. How did the providers in the 70-bed hospital in St. Cloud—built and staffed by our sisters—manage to care for all the sick? 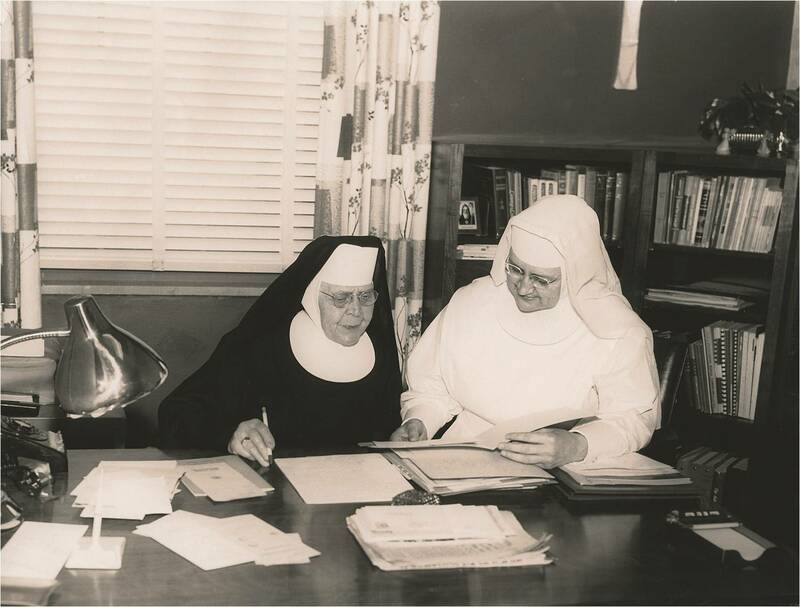 In our archives I found the memoirs of Sister Julitta Hope, one of the hospital sisters at the time. In it she relates how acute the situation was and how our sisters helped through the crisis. Valiant women indeed! I like to walk in our cemetery during November and visit the graves of Sisters dear to me. I found myself making a special pilgrimage to say thank you to those who died at the time of the epidemic. Surely some of them cared for the sick in the “overflow hospital” Sister Julitta described, and very likely succumbed to the flu themselves. It makes real Jesus’ teaching on how great a gift it is to give one’s life for others. The campaign aims to mobilize one million Catholics in the United States to confront global poverty through prayer, education and advocacy. Click here to be connected to their web site, where you will find action alerts and information regarding resources and events. Once there, you can join the campaign yourself and invite others, perhaps your parish or church community, to get involved. For more on the Sisters' involvement in social justice issues, click here. Learning and teaching energize and nurture my being. Last month I went to a workshop entitled “Anger, Forgiveness and the Healing Process” by Paula Butterfield, PhD. I didn’t try to absorb every word only because she could have written the script for Mary Tyler Moore, Bill Cosby or Jay Leno. I also appreciated the fact that her talk was filled with the wisdom-of-life stories, current ”Life Coaching” research and included a well summarized 31 page handout (not a power point) with scientific documentation of everything she presented. I continue to think about two of her helpful topics. One topic can be summarized by her description of anger. “Anger happens when one of your values has been violated.” The challenge for me is to do exactly what she suggested, related to my values. After I made a list of my top ten values, I needed to admit how much time I actually give to nurturing these each week. My weekly review was a bit shocking. Her point was, “Anger is about you, not about the situation.” I learned that anger is my friend, because after it invites me to ask, “What value of mine has been violated?” I also get to clarify to myself a whole range of values I didn’t consciously know I had. Somehow this self-awareness makes me feel more transparent (I apologize for using one of the current buzz-words). I suppose my next challenge will be spontaneously sharing those newly articulated values with people I care about. I have to admit, I still feel a little shy about by newly-articulated-value language. There is a group in Benedictine, Cistercian and Trappist circles that does not ever make a big splash, only small ripples. The group is called Monastic Interreligious Dialogue. As the name implies the focus of this group is to foster dialogue between Christian monks and nuns and monks and nuns of the great religions of the East, Buddhism and Hinduism in particular. A little over a year ago, 14 Christian and Buddhist nuns met at St. Mary Monastery in Rock Island, IL for a weekend of sharing on our respective communal and individual monastic practices. On Friday evening we began with an agenda of topics we were hoping to cover in our time together. By Sunday afternoon we realized that rather than getting shorter our agenda seemed to be getting longer and longer. As we listened to each other with the ears of our hearts we noticed that the perceived barriers between us were crumbling and that we wanted to continue the dialogue. Although we had to leave for our respective monasteries early Monday morning, we decided to continue our conversation via e-mail on a monthly basis which several of us did until the spring. Several moments of the weekend were particularly moving. On Sunday morning, we all attended Eucharist with the Sisters of St. Mary Monastery and at communion time, every Buddhist nun came forward to receive a blessing from the celebrant. Sunday evening at our closing ritual each Buddhist nun did a chant from her particular tradition which we participated in, and then the Christian monastic women sang the Salve Regina in Latin. Finally, on Monday morning, the first car was leaving at 6:30 a.m. and by 6:15 a.m. we were all gathered in the kitchen to say our goodbyes to each other. One could sense how much we wanted to prolong our time together. In early October of this year, the monastic women who are on the board of Monastic Interreligious Dialogue began planning our next gathering of Buddhist/Christian nuns in 2011. 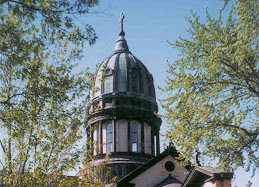 If you would like to read more about Monastic Interreligious Dialogue go to http://www.monasticdialog.com/. A ripple of excited air has been flowing over the campus of the College of St. Benedict and Saint Benedict’s Monastery since Wednesday, November 4, when the Monastery launched its new program, a program that CSB women have been requesting for several years running. More than one year ago, Prioress Nancy Bauer listened to the student voices and asked a team of sisters and students to begin shaping the volunteer service program that we are offering to our graduates. Sisters Ann Marie Biermaier and Mary Jane Berger, along with senior Maria Conroy and a few other students met every other week to determine the mission, goals and responsibilities that will be a part of the service corps. We had an excellent model to follow because our brother Abbey at St. John’s began a volunteer corps approximately ten years ago. They now have 16 sites where they send pairs of Johnnie grads each year. We anticipate that our program, too, will expand to new sites each year. Saint Benedict’s Service Corps will begin this year with two sites and two volunteers at each site. We are offering our grads a 2-week training/spiritual experience prior to their departure in late August or early September, and a follow-up reflection time after they return. When our women go to the monastic sites that we together decide upon, they will be living the Benedictine Gospel Values. As volunteers they will be hosted by the monastic community they are serving. They will join the community for prayer, work, and leisure. They will be listening to those they serve and will in turn be listened to by the sisters on site. These women will be receiving hospitality from their hosts and giving hospitality to those they serve. Since November 4, we have had a flood of interested Bennies from first-year students to post graduates. Next week, Sister Ann Marie and I will be hosting women interested in knowing more details and possibly in applying to be part of this first endeavor. We are absolutely delighted with the voices we have heard saying, “We are so glad you have finally begun a program for CSB grads”! I like opening the large oak doors to Sacred Heart Chapel. It feels to me as if I am entering a place where the more of life is being lovingly tended. Sometimes I place myself in the stillness of this vast space and truly experience it as if I am in the womb of God. I feel safe. I experience intimacy and holy tending. In this place I am confident of God’s love for me. I stay in the quiet; welcoming the Love that breaks open my heart. Light. I hear these words Do this in memory of me. In quiet, humble attentiveness I am left to ponder this encounter. Since the 1990s the U.S. officially designates November as American Indian Heritage Month. It is meant to honor Native American culture and its imprint upon this nation. My community, the Sisters of the Order of St. Benedict, based in St. Joseph, Minn., has strong ties with the Ojibwe of Minnesota—a tribe which we lived among from the late 19th into the 21st century. We served as teachers and catechists on the White Earth, Red Lake and Mille Lacs Reservations: White Earth from 1878-1969; Red lake from 1888-2009 and Mille Lacs from 1941-2001. As an historian, I did research on these three Indian missions and found much to admire as well as to regret while describing the decades of interaction between two cultures. Unfortunately, the hundreds of our Sisters who served on these missions did so ignorant of the Ojibwe rich traditions and values. Good will and zeal were abundant , but these did not fully compensate for lack of preparation and understanding over the many decades of missionary activity. However, my research and interviews with the Sisters and Ojibwe made clear that, in spite of cultural differences and misunderstandings, the Sisters and the Ojibwe grew to respect and over time to admire and even grow fond of one another. When we closed the Red Lake mission in the summer of 2009, there was a combined appreciation and farewell celebration, with the Sisters and the Red Lake people sharing many memories—mostly positive ones. I believe that the history of the interaction between Benedictines and the Ojibwe reveals a steady pattern of mutual help and friendship. Both groups found benefits in the crossing of cultural boundaries. We can hold high the memory of our long connection as we continue to honor American Indian Heritage. 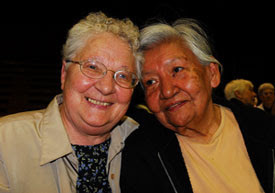 (right) Sister Theresa Lodermeier and friend at the farewell luncheon at Red Lake in June 2009.